Carolyn is a Kentucky girl, a printmaker, painter, knitter, gardener and kitchen mess-maker who lives in Austin, Texas. She creates both fine art prints and modern home decor. Her fine art work centers on dreamy, layered landscapes that evoke the history and memory of place, and bold, graphic, woodcuts inspired by rediscovering familiar foods during travel. Her home decor line, Kimball Prints, draws its inspiration from the beauty of the natural world. Carolyn graduated with a BFA from the Maryland Institute College of Art in 2003 and a MA in printmaking from the University of Louisville in 2008. 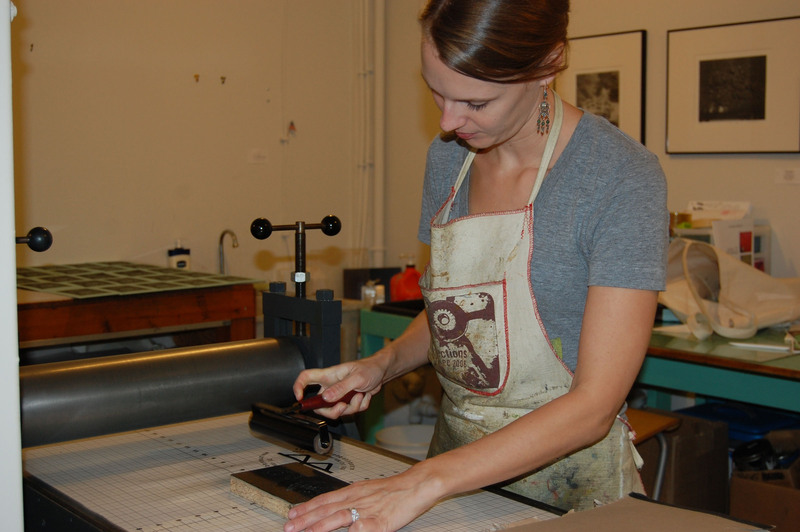 A professional artist, Carolyn is active in the Austin art community, exhibiting regularly during the East Austin Studio Tour and West Austin Studio Tour and helps run the studio of the Women Printmakers of Austin. In addition to her online store, you can find her work on Generous Art.org, the permanent collection of the Rochester Museum of Fine Arts and in private collections in the United States, England and Kuwait.